hakucho: Good News and a new pattern for you! Good News and a new pattern for you! I received good news today about Elizabeth, the little girl who had a tumor removed from her chest a few weeks ago. 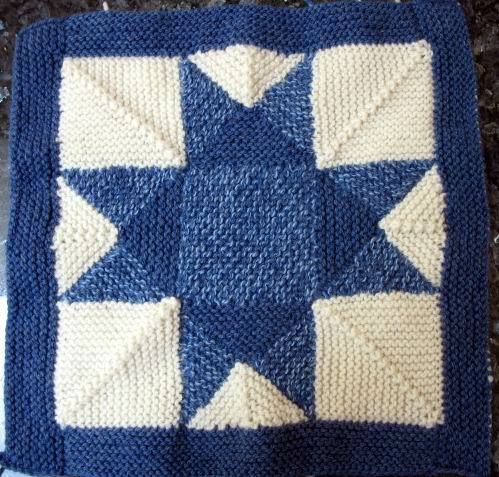 The tumor was benign :) Her family is very thankful for the good karma all the knitted squares brought to her. I'm sure all of your prayers helped as well. I'm still praying though for her recovery. From what I have heard, her incision would make you weak in the knees. I hope and prayer she'll soon be back to what she was before the surgery and then some. She's a brave and strong little girl. Now on the knitting front...I finished my socks. Please note PDF file edited 8/15/08. Minor corrections made. Sorry for any inconveniences. This is my toe-up version of the Nutkin Sock pattern. The short row heels and toes of the Nutkin sock pattern by Beth LaPensee for Knitzi.com inspired my sock pattern. Beth kindly gave me permission to use her instructions in my modified pattern. Beth pointed out to me that Priscilla Gibson-Roberts originally designed this method of doing short row heels and toes. Beth found Priscilla’s instructions confusing, so she rewrote the instructions. I love this method so much and even more so when I realized that it could easily be done toe-up. 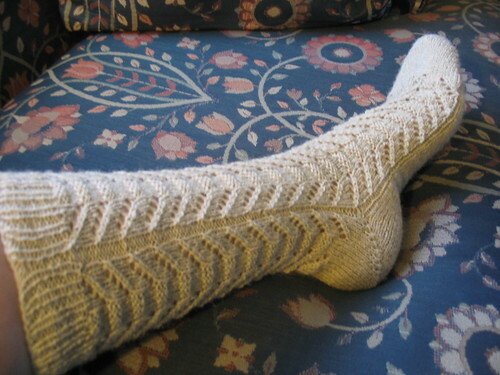 By starting with a provisional cast on, a short row toe can be immediately started. From there on it’s a cinch and no kitchener’s grafting. Hope you enjoy it as much as I do. The pattern stitch is ”Totem Pole” from Barbara Walker’s A Second Treasury of Knitting Patterns page 254. I converted the stitch pattern to knitting in the round for these socks and Meg Swanson of Schoolhouse Press kindly gave me permission to share this stitch pattern with you. You can download the free pattern in PDF format from ravelry or from my design page. This is my first attempt at a sock pattern so if you find any discrepancies please let me know. What wonderful, wonderful news on Elizabeth! The socks are great, thanks for sharing the pattern with us!! I'm so glad to hear that things are looking up for Elizabeth! Those are beautiful.... and you did them toes up! How cool. I need to try toe up socks some day but I have that sock issue. I will have to knit myself some slippers to felt first. Great news about little Elizabeth. Wow, look at you knitting and designing socks :) They look wonderful. Awesome news!! I am sooo glad to hear that things turned out okay. Love those gorgeous socks...I haven't made it to toe up socks yet but I so want to try that...I like the fact that you can try them on as you go. You're so cool - thank you! Oh, those are truly lovely! What a beautiful job! I was so glad to hear Elizabeth is doing so well! Bless her little heart; that's a lot to go through for someone so young. Your socks are just beautiful! I had wondered if you would be writing your own sock patterns. You certainly did well! Awsome sock!!! Thanks for the link for the knitting how to's. Very helpful. For some reason some I can hear her giving the instruction and on others no sound only picture. Naturally the one I ask you about is one I can hear anything; But, I watched it a few times and was able to get it. Not sure if the sound thing is them or me; but my music works fine on the computer, and I could hear some of her video's?? Thanks again, and have a great wkend. Gotta get a photo of the baby sache thingy I made next. So nice to get some projects finished. Wow! Gorgeous socks! I haven't done my first toe-ups yet, but these are definitely in the queue when I do! Sigh -- such gorgeousness! Thank you for sharing the pattern. Great sock - thanks for the pattern! Oh that is absolutely great news. Go Elizabeth!!!!!!! I love the socks, it will be on my to do list. That's great news about Elizabeth! Beautiful socks! I'll have to keep them in mind for when I want a sock pattern! Beautiful sock! Thank you for sharing the pattern! I love those socks! Great design! You're fantastic for sharing the pattern! Making bread the easy way!